Three key reports from the U.S. Energy Department address water impacts in geothermal energy production. Two recently issued studies, produced by Argonne National Laboratory for the Department's Geothermal Technologies Office (GTO), highlight methods for economizing water use in geothermal applications. These reports complement a Department-wide report released in June that assesses water usage in multiple energy applications, including geothermal. Geothermal Water Use: Life Cycle Water Consumption, Water Resource Assessment, and Water Policy Framework, now available through the Energy Department's Geothermal Data Repository, projects geothermal water demand over the next 20-30 years. Life Cycle Water Consumption and Water Resource Assessment for Utility-Scale Geothermal Systems, also available through the DOE Geothermal Data Repository is third in a series of reports by Argonne sponsored by the GTO. The Department's Water-Energy Tech Team report – The Water-Energy Nexus: Challenges and Opportunities – frames an integrated challenge and opportunity dialogue to address water use among energy technologies for the Department and its partners, laying the foundation for future efforts. An avalanche of studies is concluding that the world could entirely power itself with renewable energy in the coming decades, doing away with fossil fuels and the pollution they produce—while slowing global warming. Mark Jacobson’s name has been at the top of many of academia’s contributions to this research. For Jacobson’s latest intellectual chef-d’œuvre, he co-authored a recent paper in Energy describing how California could capitalize on its abundant sunshine, on- and off-shore winds, tides, waves, and geothermal heat to abolish fossil fuels. Electric cars and hydrogen fuel cell vehicles would be recharged using the renewable electricity supplies. To produce the 7,200 MW necessary for its projected share of powering the state geothermal would only require 0.0061% of the land. 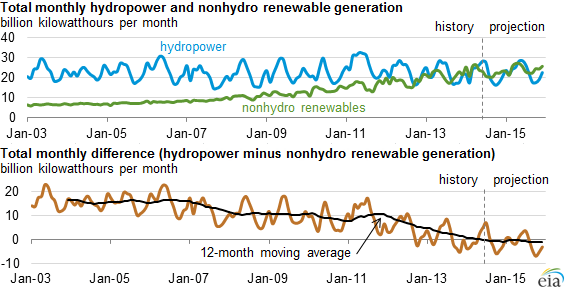 April marked the eighth consecutive month that total monthly nonhydro renewable generation exceeded hydropower generation. Only a decade ago, hydropower—the historically dominant source of renewable generation—accounted for three times as much generation in the United States as nonhydro renewable sources (wind, solar, biomass, geothermal, landfill gas, and municipal solid waste). Hydropower does exceed nonhydro renewable generation in several states, particularly in the Northwest, where in 2013 conventional hydropower accounted for 69% and 56% of total electricity generation in Washington and Oregon, respectively. However, the market penetration of other renewables is growing in the United States, particularly in the Midwest and California. Between 2003 and 2013, the number of states for which nonhydro renewable generation exceeded hydropower generation, shaded green on the maps, nearly doubled—increasing from 17 to 33 over this period. France’s planned energy law will mobilize about €10 billion (US $13.4 billion) in investment through tax credits and low-interest loans to spur efficiency and renewable power, Environment Minister Segolene Royal said. The law seeks to boost growth and jobs, and reduce bills through energy savings, she said. Measures include tax breaks and zero-interest loans for renovations to insulate homes. Other goals in the law include cutting emissions 75 percent by 2050 and getting 32 percent of energy from clean sources such as wind, solar and geothermal by 2030, up from about 14 percent in 2012. On Tuesday, July 29, there were two hearings in U.S. Congress subcommittees that are significant to the geothermal industry. A House subcommittee discussed three bills, with two specifically relating to geothermal development, while a Senate subcommittee looked at permitting needs. The U.S. House Subcommittee on Energy and Mineral Resources (of the Committee on Natural Resources) covered three bills. In his opening statement, Subcommittee Chairman Doug Lamborn referred at length to current setbacks for geothermal that could be improved with legislation. The New Zealand Ministry of Business, Innovation and Employment has today published Energy in New Zealand 2014, which contains a wide range of energy-related information based on new and consolidated statistics. Energy in New Zealand 2014 details the supply, transformation and use of all types of fuel in New Zealand. It also contains information on energy prices, international comparisons and oil and gas reserves. The contribution of renewable sources to the primary energy supply increased in 2013, from 37.5% in 2012 to 38.2%. This was due to increased geothermal generation, with new plants increasing the geothermal contribution to 54% of total renewable primary energy. There was an increase in geothermal generation, from 5,843 GWh in 2012 to 6,053 GWh in 2013. In the 2013 calendar year, geothermal generation was boosted by the new geothermal power stations coming online near Taupo. The Ngatamariki power plant was fully commissioned in 2013 and late in the year, the Te Mihi power station generated electricity while in its testing phase. The Te Mihi geothermal power station will be commissioned in late 2014, and will increase geothermal capacity by a net 114 MW. The increase in geothermal baseload generation reduces the extent that fossil fuels are required in peak demand periods. The APEX/ASTM Environmentally Sustainable Meeting Standards, administered by the Convention Industry Council, guide planners and suppliers in producing greener events. "We are proud and excited to be the first convention center to attain Level Four of the ASTM Venue certification," said Scott Cruickshank, executive director of the OCC. "Certification to the industry's global standard at its highest level is further evidence of OCC's ongoing commitment to sustainability." iCompli, a division of BPA Worldwide, a nonprofit international auditing organization, performed the independent third-party evaluation. The center offers two ballrooms, 50 meeting rooms and 255,000 square feet of contiguous exhibit space. The GRC Annual Meeting & GEA Expo will be held at the Oregon Convention Center, Portland, Oregon, USA from September 30 -October 1. Comments submitted by Scott Nichols, Manager of Permitting & Lands for U.S. Geothermal Inc. to the U.S. Senate Committee on Energy on July 29, 2014 regarding obstacles in permitting energy projects on federal lands. "Mr. Chairman and members of the Subcommittee, my name is Scott Nichols and I am here today representing U.S. Geothermal. My comments are focused on the BLM and USFS (Agencies's) evolving approach in administering the National Environmental Policy Act (NEPA), the geothermal industry's evolving approach to environmental management, and support for action requiring agencies to rigidly defined NEPA implementation and federal regulations. Our overwhelming experience is that management decisions are now driven by lawsuits, attorneys and the Office of General Counsel combined with a need for more data and longer evaluation periods. Documentation has become more important than good science." Brett Hannigan, president of the Sauder School of Business’ Natural Resources Club at the University of British Columbia, explains why he thinks geothermal is the most efficient form of renewable energy. "The most efficient form of renewable energy right now is geothermal. Initial costs associated with installation can be high, but the energy savings are enormous. Geothermal plants produce a fewer amount of greenhouse gases relative to fossil fuel plants, and the water used to extract heat from the Earth can be recycled. Geothermal energy does have its limitations, namely cost and geographic barriers, but it is efficient and constant." Kenya Electricity Generating Company (KenGen) is adding 140 MW to the national grid from the 280 MW Olkaria IV geothermal project. The 140 MW is from two units – one of which has already completed reliability test while the other is expected to complete the test by mid August. At the same time, two more units are expected to commence reliability tests in September and October respectively. It is expected that before the end of the year, the entire 280 MW will be fully commissioned. A senior team from Cornwall recently returned from a fact finding mission to Germany to explore and learn more about geothermal energy. The trip, which was organised by EGS Energy, was joined by representatives from a number of firms and organisations, including Cornwall Council, the Cornwall and the Isles of Scilly Local Enterprise Partnership, the Eden Project and Geothermal Engineering Ltd. The delegation met with Jörg Baumgärtner from BESTEC GmbH, a world-leading geothermal specialist, to discuss the deep geothermal plants that are planned for Cornwall and visit an operational plant in Insheim. 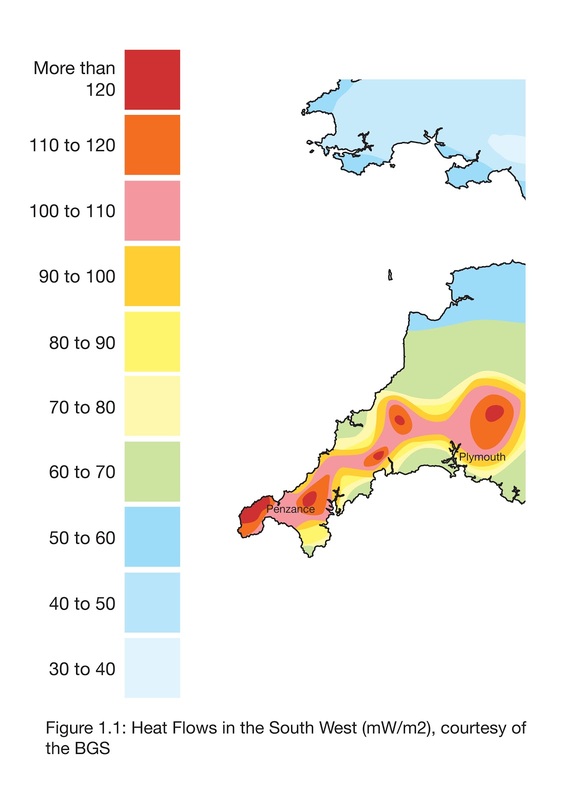 Andrew Williams, of the Cornwall and Isles of Scilly LEP, said: “The trip highlighted the real economic potential for Cornwall to generate its own energy from deep geothermal and the opportunities for individuals and businesses to benefit both directly and indirectly from the heat and power created. A crew works at a geothermal drilling site in Rincón de la Vieja National Park, in Guanacaste. A proposal by lawmakers from Guanacaste seeks to build three geothermal plants inside the Rincón de la Vieja National Park. Opponents worry that drilling and producing geothermal energy there could damage the park’s protected land, and they are urging caution. If all three plants are built, Costa Rica’s energy production could become 100 percent renewable. From 1990 to 2011, the Central American nation has averaged producing 6 percent of its energy from oil, according to the most recent data from the International Energy Agency (IEA). Since geothermal first came online in 1992 in Costa Rica, it has produced 12 percent of the country’s energy. Expansion proponents said the three sites would raise geothermal’s share by 10 percent, more than covering oil’s output. Costa Rica burns no other hydrocarbon for electricity. A major hurdle for the projects has been Costa Rica’s national park laws, which prohibit resource extraction. Check out this presentation from the Borealis GeoPower website that explains step-by-step what geothermal energy is all about: where it comes from, how it’s used and the challenges it faces. It also describes the current state of geothermal energy use globally and an estimate of just how much could be harnessed by humans for power generation and heating. If you are looking for proven renewable energy technology that is clean, firm and cost-competitive, geothermal power looks hard to beat – at first blush. Unlike wind or solar, which are intermittent, geothermal power plants provide electricity around the clock, and the energy source is free: the heat from the Earth. It’s mature technology that has been used in Italy for more than a century. Geothermal power plants are comparatively cheap to build, and they have a much smaller environmental footprint than hydroelectric dams. Situated as it is within the Pacific Ring of Fire, B.C. has some of the best potential geothermal assets in Canada and is home to Alterra Power Corp., which owns and operates two geothermal power plants in Iceland and one in Nevada. “We’re really in a unique spot in B.C., with so many available fuels,” said Paul Kariya, executive director for Clean Energy BC. Terrace city council recently received an update on what could be Canada's first major geothermal power plant constructed somewhere in the Lakelse Lake area, where a plenitude of hot springs have alerted a Calgary-based company to the potential for low impact power generation. Calgary-based Borealis Geopower received the necessary permits to begin exploration on their Lakelse Geothermal Project back in January for a 2,800 hectare area in which to assess the possibility of building a 15-megawatt power plant that works by converting the heat drawn from hot water into electricity and then cycling the water back underground. A small Borealis crew began their work in early June within an area which extends from south of Lakelse Lake and up the east side of Hwy 37, with a couple small test sites located within the Skeena Industrial Development Park. Italy’s Enel Green Power (EGP) will seek to sell a minority stake in its North American renewables portfolio and dispose of its entire French wind business, the company said today. Newly-installed CEO Francesco Venturini said the group has begun sounding out buyers for a possible minority equity stake in a package of wind, solar, hydro and geothermal capacity. According to its website Enel Green Power North America is a leading owner and operator of 72 MW in geothermal - 25 MW Cove Fort geothermal plant, Utah, 33 MW Stillwater geothermal plant, Nevada and the 13.4 MW Salt Wells geothermal plant in Nevada. Register Now for the Geothermal Energy Event of the Year! Reserve Your Hotel Room! GRC Room Block Expires September 3rd! Sponsorships Still Available! Don't miss out on the chance for high visibility at the largest annual geothermal gathering in the world. Save $100 by registering before August 31st! Special informational lunch with presentations and discussions led by globally known experts in the geothermal community. Great networking opportunities. Free with your registration! Don't forget to mark the option on your registration form or when you register online. Industry leaders will meet with students attending the GRC Annual Meeting during Tuesday’s lunch hour. Discussions between the leaders and students over lunch will provide one-on-one opportunities to share ideas about key topics on a variety of geothermal interests. Free with your registration! Don't forget to mark the option on your registration form or when you register online. More than 125 booths were on show at last year’s Expo, showcasing projects, equipment, services and state of the art technology to the geothermal community. Entry to the trade show is free with a GRC Annual Meeting registration. Get the latest news on the geothermal event of the year at www.geothermal.org. The U.S. Geothermal Energy Association is holding its fourth annual National Geothermal Summit on Tuesday, August 5th and Wednesday, August 6th in Reno, Nevada, USA. The National Geothermal Summit is the leading forum for western state policy discussions, bringing together policy leaders, utilities and industry professionals to discuss the opportunities and challenges facing the industry. 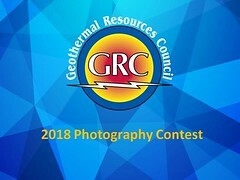 The Geothermal Resources Council (GRC) is proud to be a supporter of the event and will be exhibiting at Booth #26 on Tuesday, 12:00 pm to 6:30 pm and on Wednesday, 8:30 am to 6:00 pm. Come say hello and get more information on joining the premier global association for the geothermal energy community and of the upcoming GRC Annual Meeting & GEA Geothermal Energy Expo. GRC Twitter Feed Reaches 1,300 Followers! 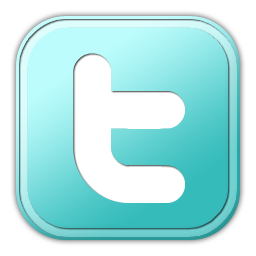 The Twitter feed of the Geothermal Resources Council has reached 1,300 Followers! If there is one thing that works in the world of advocacy, it is a ratings table that shows how one state, metropolitan area, or utility compares to its peers. 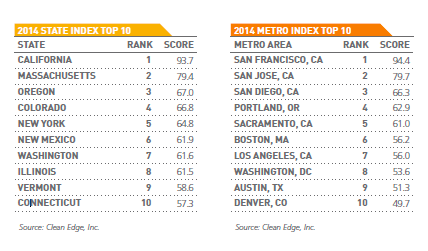 The latest report, U.S. Clean Tech Leadership Index, from Clean Edge does just that. 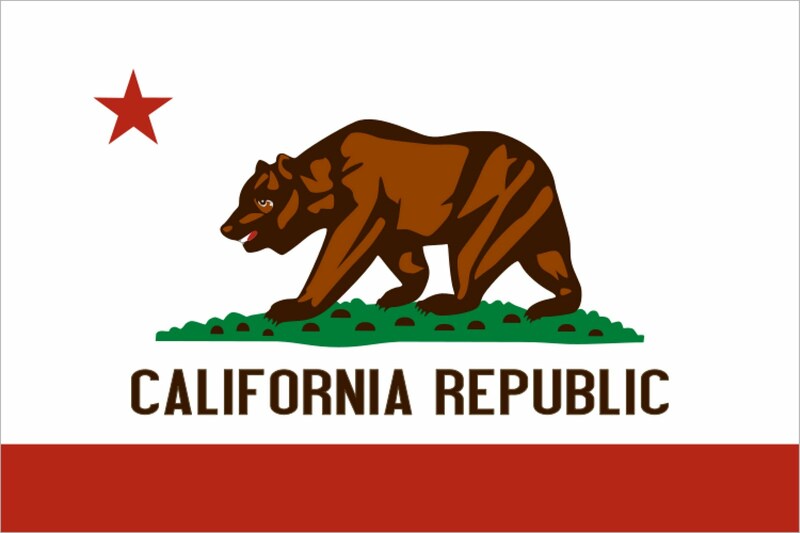 For the fifth consecutive year, California tops the State Index by a wide margin, scoring 93.7 overall. The Golden State’s clean-tech prominence is broad and deep; it leads the Technology category handily and ranks a very close second in both Policy and Capital. With enviable solar, wind, and geothermal resources, a green-minded populace, and generally effective policy levers at every level of government, California places #1 in all three subcategories of clean technology deployment: electricity, transportation, and energy efficiency/green buildings. And the state nearly takes home our Index triple crown, finishing a very close #2 in the Policy and Capital categories. As in 2013, California is also home to five of the top seven cities in our Metro index: San Francisco, San Jose, San Diego, Sacramento, and Los Angeles. No one claims that geothermal energy is going to solve all our energy needs. But it is a proven and reliable source used around the world. In a recent Honolulu Star-Advertiser column, Richard Borreca argues that “It just may be . . . geothermal energy is not the easy solution to Hawaii’s energy needs,” despite what he describes as Governor Abercrombie’s “infatuation” with it. Headquartered in Nairobi, the Geothermal Development Company (GDC) is a 100 percent state-owned business, formed especially by the Government of Kenya to act as a special purpose vehicle to fast track the development of the country’s geothermal resources. An indigenous, abundant and reliable source of electricity, Kenya’s geothermal resources are concentrated within the country’s Rift Valley. It is here that some 14 fields can be found extending from Lake Magadi to Lake Turkana. In addition to these fields Kenya also hosts several low temperature fields outside the rift at Homa Hills and Massa Mukwe. At present geothermal energy contributes approximately 209 MW towards Kenya’s power mix, a figure which amounts to around 22 percent of the country’s total production, while its geothermal potential has been estimated to reach up to 10,000 MW in the long term. This pre-summit workshop seeks to engage individuals in the geothermal community who are interested in participating in a discussion regarding the terminology and approaches used to characterize geothermal resources in the United States. GEA and DOE will be presenting some of the work they have been doing related to geothermal reporting methodologies. The goal of this workshop is to introduce participants to the results of these initial analyses, to solicit feedback on the terminology, concepts, applications for geothermal reporting, and to collect input to guide the next steps for these efforts. This meeting will discuss the Energy Department's $31 million funding solicitation to establish the initial phases of a field laboratory dedicated to cutting-edge research on enhanced geothermal systems (EGS). The new Frontier Observatory for Research in Geothermal Energy (FORGE) initiative will focus on techniques to effectively stimulate large fracture networks in various rock types, technologies for imaging and monitoring the evolution of fluid pathways, and long-term reservoir sustainability and management techniques. The webinar will provide an overview of the three phases of FORGE development with an emphasis on Phases 1 and 2, which focus on selecting both a site and an operations team, as well as preparing and fully characterizing the site. Lauren Boyd, EGS program manager for the U.S. Department of Energy, will present. The event can be attended via live webinar or in person at the pre-Summit event of the GEA Summit. As promised by Dr. Kato Kimbugwe, a team of experts, Mike Allen, Dr. Graham Ryan along with Paul Brophy, among others were due to be on island at the beginning of this week. Kimbugwe revealed that two geothermal wells had been undergoing testing for some time, “Both wells are producing just about 1.5 megawatts…” and that be a third well will be drilled. Geothermal advisor to the Government of Montserrat, Mike Allen and Consultant Paul Brophy, president of EGS, Inc. and the president-elect of the GRC, met with the local Geothermal Steering Committee to provide an update on the process which has been achieved to date. Mike Allen reported “..... we are going to drill a third well and the team has been on the island here, the team from EGS, from Capuano Engineering, from Oakland University and myself and we have been reviewing the location for the third well, that still has to be finally confirmed but the general agreement is to the target for that and the confirmation should be within the next ten day or so." Thanks to a plethora of geothermal energy found beneath the island’s crust, the typical Icelandic power bill dwarfs that of its North American and European counterparts. In fact, Iceland produces about five times more energy domestically than this “Viking nation” actually needs. Therefore, due to the tremendous energy surplus geographically gifted to this Nordic country located in the North Atlantic, a massive project has been in the works to help Icelanders share this natural resource with the rest of the world. Exporting its surplus of “green energy” would help Iceland harvest a new form of internal income aside from the fishing and tourism industries that currently make up a majority of the country's domestic economy. Plans have been put in place for a £4.3bn Transatlantic Sea Cable that will allow Iceland to share its abundance of energy with the United Kingdom, a landmass plagued by expensive heating bills and growing energy shortages. It seems like the puzzle pieces fit perfectly as Iceland would be able to ship out its surplus of geothermal energy to the power-starved Brits, and the UK would welcome a cheaper alternative to their current energy situation. Additionally, this form of “green energy” will help the UK ease off of the "less desirable" forms of nuclear energy that it currently uses. If they don’t use it, they lose it. Thus, Iceland needs to make this “power play” happen to cash in on their geothermal revenue stream. Washington appears to be the latest US state considering tightening its climate laws, with plans for a cap and trade system released on Monday. A memorandum posted on Governor Jay Inslee’s website says design options on a carbon trading scheme will be presented by the Community Emergency Response Team (CERT) later today. The document suggests the northwest US state could link up with the Western Climate Initiative (WCI) trading scheme, which involves California together with the Canadian states of British Columbia, Ontario, Quebec and Manitoba. According to the US Energy Information Agency, geothermal sources in its volcanic Cascade Range could “produce about 2.5 billion kilowatt-hours of electricity per year”, enough to power 265,000 US homes. Major aid agencies in the Caribbean have announced cooperation to develop geothermal energy in the region. The Caribbean Development Bank, Japan International Cooperation Agency (JICA) and the Inter-American Development Bank (IDB) will be working closely to transform the energy landscape in the Eastern Caribbean. Together, the agencies will support the efforts of Eastern Caribbean States to tackle high energy costs and reduce dependence on fossil fuel-generated energy by diversifying its energy matrix and promoting renewable energy and energy efficiency. The Memorandum of Cooperation will identify and support programs and projects which explore a joint effort for further introduction of renewable energy and energy efficiency in the EC countries, with special focus on geothermal development. GNS Science and Waikato University are investigating one thousand of the geothermal hot springs in New Zealand's North Island. The goal of this ambitious 1000 Springs Research Project is to understand and compare the microbiology of these springs along with their physical and chemical make-up. That adds up to a lot of sampling trips, processing of data and investigation of the findings! Building gas turbines and pumps for thermal, nuclear and geothermal power plants already delivers more than one-third of revenues at Mitsubishi Heavy. It’s the Tokyo-based company’s biggest contributor to operating profit. Hitachi Ltd.’s chief executive officer said he’s open to deeper ties, which could include merger talks, with Mitsubishi Heavy Industries Ltd., after the equipment makers failed in their bid for Alstom SA’s power business. Mitsubishi Hitachi Systems Americas is exhibiting at the GEA Geothermal Energy Expo, being held in conjunction with the GRC Annual Meeting, September 28 - October 1 at the Oregon Convention Center, Portland, Oregon, USA. A new Stanford University study proposes a plan that will have the state of California running entirely on renewable energy by 2050, creating a healthier environment, generating jobs and stabilizing energy prices. The research team contends that it is both technically and economically possible to convert California's infrastructure to one powered by clean, renewable energy. They outline their plan for a sustainable, inexpensive and reliable energy supply in the journal Energy. "If implemented, this plan will eliminate air pollution mortality and global warming emissions from California, stabilize prices and create jobs -- there is little downside," lead author Mark Z. Jacobson, a Stanford professor of civil and environmental engineering, said in a statement. The proposal will reportedly fulfill all of the state's transportation, electric power, industry, and heating and cooling energy needs with renewable energy by 2050. The 20 MWe Maibarara integrated geothermal power facility that started commercial operations early this year would soon be expanded to the tune of $25 million to address the surge in demand for energy. PetroEnergy Resources Corp., which leads the project vehicle Maibarara Geothermal Inc. (MGI), may expand the project in two phases. “We are expanding Maibarara by 10 MW to bring the capacity to 30 MW. Our [capital expenditure] for that is about $25 million. After that, we will consider another expansion,” company vice president Francisco G. Delfin Jr. told the Inquirer. Work will start within the year so that the expansion may be completed by end-2015 or early 2016, he said. PetroEnergy Resources president Milagros V. Reyes said after the 10-MW expansion, another 10 MW in capacity may be added. The existing 20 MW integrated steamfield-power plant facility in Sto. Tomas, Batangas entailed an investment of $78 million, of which almost $55 million was financed through loans, via RCBC and BPI, while equity accounted for the balance of about $23 million. A new project partners with geothermal power plant to stash carbon dioxide in the form of minerals. How can we get rid of excess CO2? Geologist Juerg Matter of the University of Southampton, U.K. is a principal investigator of the Iceland-based project CarbFix, whose recent results show it has safely stored nearly 170 tons of carbon dioxide underground by reaction with minerals—stashing it in rock so it can’t leak out again. The next step is to go big. "In our pilot project in Iceland, called CarbFix, we take CO2 and wastewater from the same geothermal power plant and inject them together. The CO2 dissolves and, like in a bottle of sparkling water, it stays dissolved as long as it's sealed. It then reacts with calcium and magnesium silicates in rocks to form carbonates. For CarbFix the electricity comes from geothermal power, so the emissions penalty for injecting dissolved CO2 is on the order of 0.2 percent. With electricity from a coal-fired power plant, the penalty would be much higher, over 10 percent of the volume stored." HRL still determined to explore and develop its main geothermal projects in the Otway Basin in Victoria. Hot Rock Limited of Queensland, Australia has published its Annual Financial Report for the year ended 30 June 2014. Mark Elliott, Chairman writes "The 2013-14 financial year was another difficult year for our company. 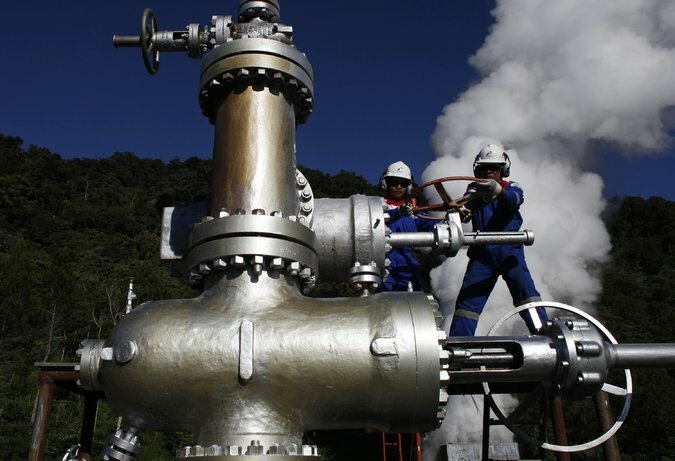 In order to survive, the Company sold its geothermal projects in Peru and Chile to Energy Development Corporation (EDC) for US$3 million, and dramatically reduced costs through the closure of all offices and the retrenchment of our staff. These actions were necessary as capital markets and investors continued to ignore the junior end of the market making it very difficult to raise funds or secure new partners to support exploration programs. Furthermore there is continued uncertainty in the political and regulatory risk jurisdictions and its ongoing negative impact on the development and investment in renewable energy in Australia. 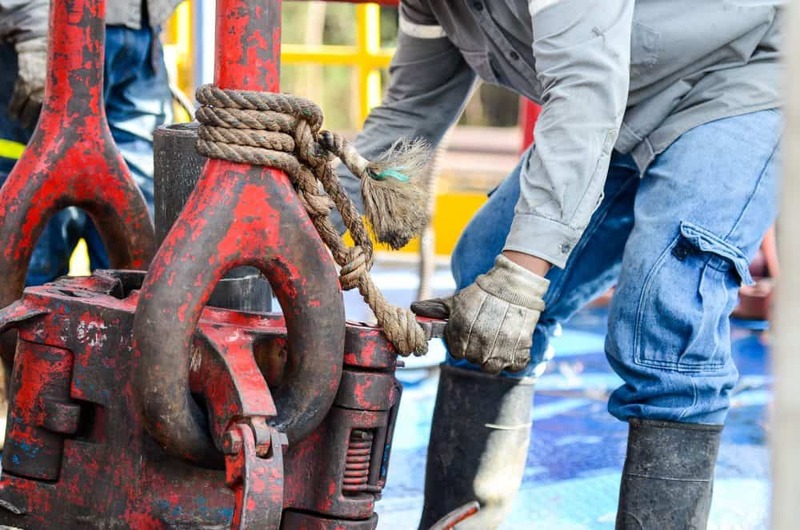 This led HRL to investigate an expansion of its activities and your Directors have reviewed many project and business opportunities since late 2013 looking for opportunities to grow shareholder value." The American Samoa Power Authority (ASPA) has teamed up with Quantec Geoscience to look for a source of geothermal energy beneath certain parts of Tutuila, as confirmed by ASPA CEO Utu Abe Malae. The hope is that this form of renewable energy will be able to replace diesel fired power plants in the territory. 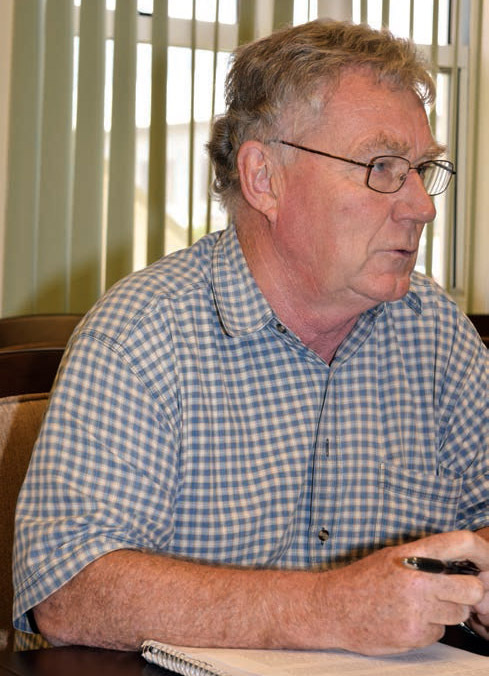 He said that ASPA contracted Quantec Geoscience based out of Toronto, Canada as part of the Geothermal Resource Evaluation Project funded through the Department of Insular Affairs. The National Energy Administration of China is developing its 13th five-year plan (2016-2020) for the development and use of geothermal resources, in a move to further boost the development of the sector, according to China Securities Journal. Renewable energy projects such as wind, solar power and geothermal energy developments will each year have to compete for a share of £205m under the UK's new clean energy subsidy regime, the government revealed today. The U.K. Department of Energy and Climate Change (DECC) revealed the long-awaited draft budgets just a day after the European Commission confirmed State Aid approval for the Contract for Difference (CfD) subsidy regime that will deliver the funding by guaranteeing developers prices for the clean power they generate. As expected, the government has split the budget between established technologies, such as solar power and onshore wind, and immature technologies, such as offshore wind, wave and tidal, advanced conversion, anaerobic digestion, dedicated biomass with CHP, and geothermal. Developers will be able to bid in auctions for projects that can come online through to 2019, meaning the benefits associated with faster delivery are unlikely to be recognized by the new policy regime. The development of geothermal energy in Armenia is a perspective direction, which can give a substantial solution to the energy security issue in Armenia. This is the only technology, which can provide the guaranteed energy production, as the other sources of energy, including solar, wind, and renewable, have a seasonal character. In a conversation with Armenpress, the Director of Renewable Resources and Energy Efficiency Fund of Armenia Tamara Babayan stated that about USD 9 million grant was provided to Armenia by the Climate Investment Fund, which will be directed at the study of opportunities for the development of geothermal energy. There’s big geothermal potential in the eastern Caribbean. Dr. Warren Smith, head of the Caribbean Development Bank, told BusinessGreen that at least $30 billion is needed to update and modernize the Caribbean’s energy infrastructure in order to protect it from extreme weather circumstances. This means there is a lot of potential for local and international companies to launch important projects within the region. Smith also told BusinessGreen that the constant cycle of borrowing money for repairs needed from extreme weather events is hindering economic growth in the area. Updated renewable energy infrastructure could help break this economic catch-22. Smith told BusinessGreen that they could not only reduce their dependency on fossil fuels by tapping into this, but also export energy to other islands. "The other benefit here is that they would be able to build a size of plant that is bigger than what they need for their own market so they would get economies of scale and a lower cost of electricity," he added. Mighty River Power today announced a realignment of its leadership team under incoming Chief Executive Fraser Whineray from 1 September as the Company prepares for the next phase of its evolution. A new role of General Manager (GM) Geothermal has been created, which will replace the disestablished roles of GM Operations and GM Development. Mark Trigg, currently GM Development, has decided to leave the company towards the end of the year but has agreed to act in the role of GM Geothermal to assist through the CEO transition. Mighty River Power’s investment of $1.4 billion in geothermal development and the successful construction of three major geothermal power stations has grown geothermal to more than 40% of the company’s annual production. The creation of the GM Geothermal role allows both domestic and international geothermal activity to be brought under one member of the executive team. The new role is also responsible for technical services, drilling and joint ventures. Mark Trigg will be acting in this role in the short-term, and a permanent replacement will be recruited later in the year. Orix Corp. plans to build as many as 15 geothermal power stations in Japan over the next five years. The Tokyo-based finance and leasing company, which has been developing solar and biomass projects, is conducting geological surveys in Hokkaido and Aomori Prefecture, spokeswoman Tamaki Shibata said Wednesday. Orix plans to invest as much as ¥25 billion, the Nikkei newspaper reported, though Shibata said estimates at this stage are premature. 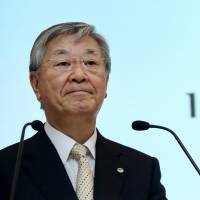 The company will focus on smaller plants of about 2 MW as they can be set up quickly, Shibata said. Environmental impact assessments for plants with 7.5 MW of capacity or more are often required, according to the Environment Ministry’s website. According to a news release Orix will commence commercial feasibility studies on geothermal power generation business in Hakodate City, Hokkaido Prefecture, and Kazamaura Village, Aomori Prefecture. A UK-based geothermal energy company has secured £15m to roll out its technology at 15 Sainsbury’s stores this year, with further financing lined up to expand the business over the coming years. Geoscart, formerly known as Greenfield Energy, yesterday confirmed it had agreed a long-term financing deal with Macquarie Lending to deploy its systems, which integrate geothermal energy generation, heat pumps, and solar thermal panels, at commercial premises across the country. The company said it had secured £15m for the initial phase of the rollout, which will see it install boreholes and ground source heating systems across 15 Sainsbury’s stores. It added that it had also lined up "significant funds" to support further expansion in phase two of its planned rollout. Sainsbury's has already installed 14 geothermal and heat pump systems at its stores, but is planning to roll out the technology across 100 stores over the next three to four years, allowing it to benefit from lower energy bills and payments through the government-backed Renewable Heat Incentive. Geothermal energy — tapping into heat deep underground and using it to produce power — is sometimes described as a forgotten renewable. It languishes in the shadows of better-known sources like wind and the sun, and in 2011 it accounted for less than 1 percent of electric power worldwide, according to last year’s World Energy Outlook. Yet the geothermal industry is growing, if slowly, and proponents hope that new technologies — including tie-ins with drilling for oil and natural gas — will bring further gains. Last year, the amount of electric power capacity available from geothermal resources grew about 4 percent to 5 percent globally, according to a report released in April by the Geothermal Energy Association, which is based in Washington. The United States remains the world’s leader in the use of geothermal energy for electric power, followed by the Philippines, Indonesia and Mexico, according to the report. Six months of retirement was enough for Dennis Gilles. He took overseas trips he'd had no time for in 23 years as an executive at California energy company Calpine Corp. He tinkered with his 1967 Ford Mustang at his home in Sonoma County. But drinks by the pool got old. He was bored. So Gilles accepted a position in 2011 on the board at U.S. Geothermal, a tiny company in Boise, Idaho. "I was still antsy, still feeling I had a lot to contribute," he said. "I was well known and well connected in the geothermal world. I wasn't done by any means." Less than two years later, Gilles succeeded founder Daniel Kunz as U.S. Geothermal's CEO. The groundwork was already laid for the company to turn its first profit in 11 years when Gilles took over in 2013. Now, Gilles says he plans to build U.S. Geothermal into a large-scale power company. 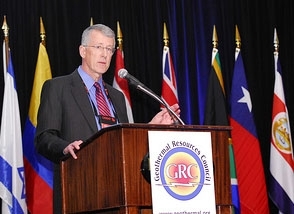 Douglas Hollett, GTO Director, will deliver a keynote speech at the Geothermal Resources Council Annual Meeting in Portland, Oregon on September 29, 20143 - the largest annual gathering of geothermal stakeholders in the world. The US Department of Energy wants to mobilize federal government, oil and gas industry, university, and other research to address subsurface engineering challenges, particularly controlling fracture propagation and fluid flow, officials said at the first of several projected discussions. The industry learned from experience after it starting producing oil and gas from tight shale formations in 1995-96, observed GRC Member Doug Hollett, director of DOE’s Geothermal Technologies Office and a member of the department’s Subsurface Technology and Engineering Crosscut Technical Team. Hollett noted that nine core areas, including wellbore integrity and new subsurface signals, were identified during a Mar. 14 national labs summit. Common interests, goals, and concerns already have emerged as diverse groups conducted research, he said. At least three more of these discussions where critical questions can be asked will be held, including possibly one during the American Geophysical Union’s fall meeting Dec. 15-19 in San Francisco, he said. The Asian Development Bank (ADB) will provide a loan of up to $50 million, supported by the Clean Technology Fund, to share risks with the private sector during the project development and exploration phase of the Rantau Dedap geothermal project in Indonesia. Indonesia has an estimated 29,000 MW of geothermal resource potential, but less than 5% of this potential has been developed. Proving commercial viability for a geothermal project requires a much higher upfront investment than for any conventional fossil fuel project. As such, the lack of an early-stage risk sharing option remains a fundamental obstacle to geothermal power expansion not just in Indonesia, but globally. The Rantau Dedap project is located in South Sumatra. During this initial phase, the project will conduct the geothermal resource exploration involving the drilling and testing of wells. If developed to the targeted capacity, the project is expected to be able to support at least 240 MW of geothermal power generation capacity over 30 years and an estimated net reduction in carbon dioxide emissions equivalent to 1.1 million tons per year. The project will be implemented under a 35-year geothermal operating license, a 30-year energy sales contract with Perusahaan Listrik Negara, the national electricity utility company, and a business viability guarantee from the Ministry of Finance.